Every month thirty children's book-experts from Germany, Switzerland and Austria choose the best seven new children's books. These are announced by Deutschlandfunk. 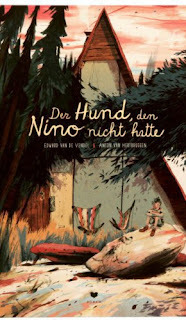 In August the German translation of the book that Anton Van Hertbruggen and I made, HET HONDJE DAT NINO NIET HAD (THE DOG NINO DIDN'T HAVE) was one of the seven. The book is called DER HUND, DEN NINO NICHT HATTE in German, and was translated by Rolf Erdorf for Bohem Press. More info on the list: here. Originally the book came out at De Eenhoorn, Belgium. It already got the French Prix Sorcières, the Dutch Golden Palet and the Flemish Boekenpauw Award. The book came out in China, France, Germany, Denmark and will shortly be published in the United States and Brazil.